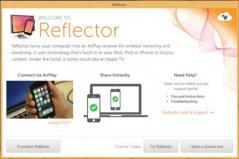 Reflector is a functional application that allows you to wirelessly connect your iPhone, iPad or iPod touch to the PC and view their activity on the desktop via a wireless connection. This is made possible by using AirPlay, Apple’s network protocol. Reflector allows you to send content from your smartphone or tablet on your computer’s screen using a wireless network. Your iPhone or iPad’s content is displayed on the computer monitor as soon as you toggle on the mirroring option on your mobile device. You can keep the program on top of other active windows or launch it in full screen mode. Also, you can select the device type in the Preferences window so the video output will be optimized. Reflector will automatically switch to landscape when you rotate the phone and comes with support for high definition resolutions.